The Committee was an improvisational satirical review founded by Alan Myerson and Irene Riordan, who had both been members of Second City in Chicago. (Irene later married Alan and renamed herself Jessica Myerson.) The Committee opened its doors at 622 Broadway in San Francisco on April 10, 1963. The company continued at that venue until early 1973, when the theater closed. For about another year the group continued to perform as a touring company. From early 1968 until 1970, a second company of the Committee performed at the Tiffany Theater on the Sunset Strip in Los Angeles. The Committee lives again in these photos by John Byrne Cooke. 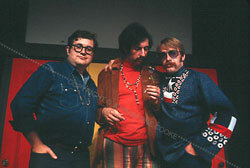 They were taken at the Committee Theater at 622 Broadway in San Francisco in June 1968, during a one-time event called the Satirithon.